SUPAWOOD’S acoustic and decorative panels create a dominant feature in the entry of one of Australia’s largest Data Centre at Alexandria, NSW. The designers, Greenbox Architects, were engaged to turn a massive existing warehouse into a high-tech state of the art facility. The project has been designed and delivered to achieve a US Green Council Gold LEED rating. The client expected strict compliance with design and construction guidelines as part of their global image as well as an extremely quick turnaround. SUPACOUSTIC and SUPALINE panelling from SUPAWOOD was chosen for the entry foyer because the products not only met all the client’s environmental and performance criteria, but made the perfect visual impact possible. 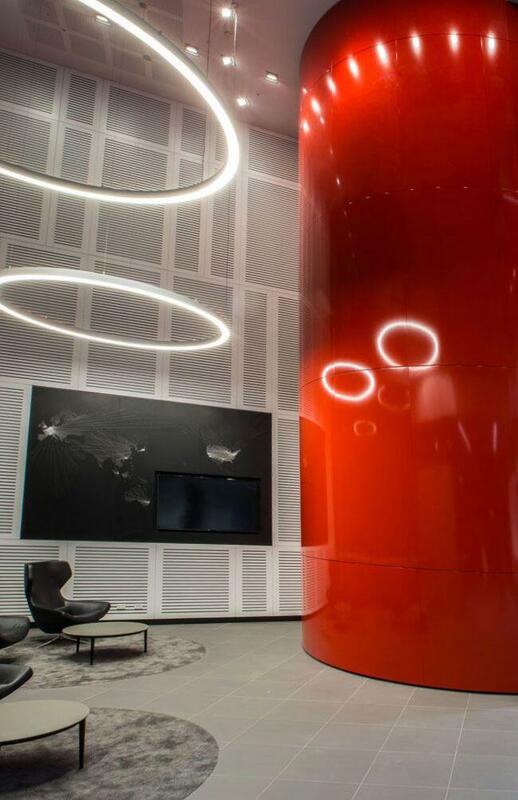 SUPALINE curved and flat decorative panels in SUPACOLOUR high gloss red form the dramatic impact statement in the entry and reflect the client’s branding. SUPACOUSTIC and SUPALINE panelling in SUPACOLOUR white to help reflect light has been chosen for the walls in the foyer. A V-slot acoustic pattern has been used to dull noise reverberation in the high open space while adding texture to broad expanses of wall. In both areas the finishes used are extremely durable and highly impact resistant. Sustainability of the products use in this refurbishment was mandatory and all the paneling supplied was made from material that was FSC® certified timber, low VOC and EO low formaldehyde. Supplier reliability was essential for the project to stay on track and meet the tight schedule demanded by the client. Supawood were recognized for not only the quality of their products, but for always meeting tight lead times. 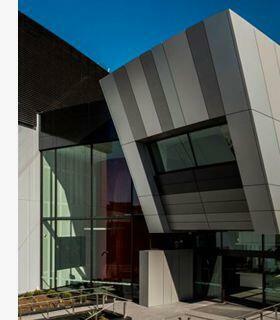 Products/Finishes: Walls: SUPACOUSTIC V-slot slotted acoustic and SUPALINE panels in SUPACOLOUR white. Features: SUPALINE curved and flat panels in SUPACOLOUR high gloss red. For more information visit the Supacoustic page. For more information visit the Supacolour page.